You can see the little corner garden now is cold and unappealing but at least those huge bushes are gone and we can see now out into the world a little more. 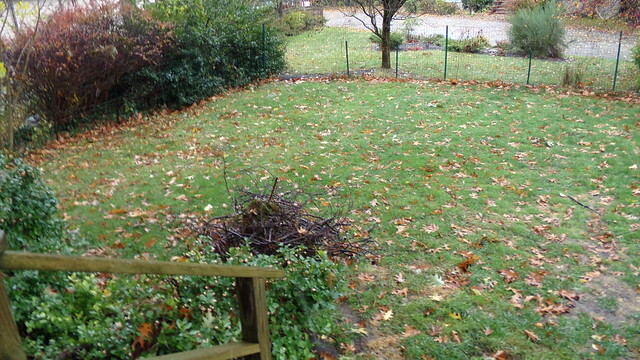 See the pile of branches and twigs that Paul raked up? Those all came off the tree above in the wild wind storms we’ve had over the last two weeks. 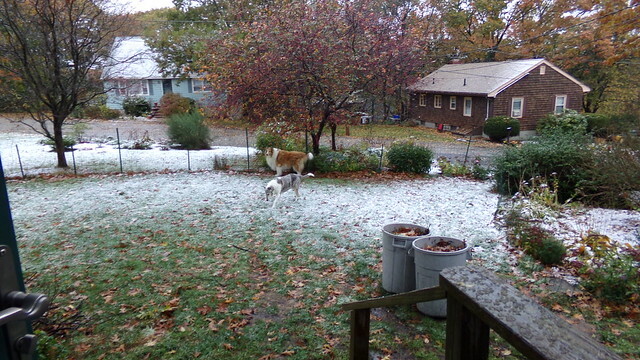 Some bigger branches came off out back in the dog pen area, but the dogs don’t use that pen any longer. 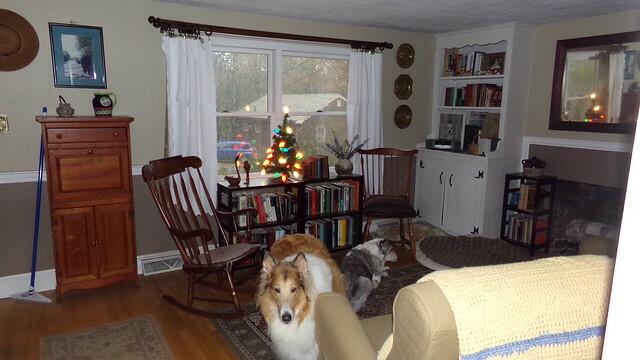 And lastly, but not leastly, inside, warm and dry, we are enjoying my newly named “Feel-Good-Tree” all lit up. Maybe I’ll light that one up today. I love holiday lights – they really brighten up the mood on a dark, wet, less than perfect wintery day, although it’s still fall. We’ve had two nor’easters in the last two weeks and the dark wet weather is getting to me. So my “feel-good-trees” are helping! I was glad to read in Nora’s blog that she got a copy of “Local Hero” from hubby and watched it and loved it. It’s just one of those films that come along once in a blue moon. I could not find my copy of it here last weekend so I ordered an inexpensive copy of it online and it came the other day. It’s going in the DVD player maybe today, maybe tomorrow. Another “feel-good” item to have stashed away! The sun came out today but that darn wind is still howling around. 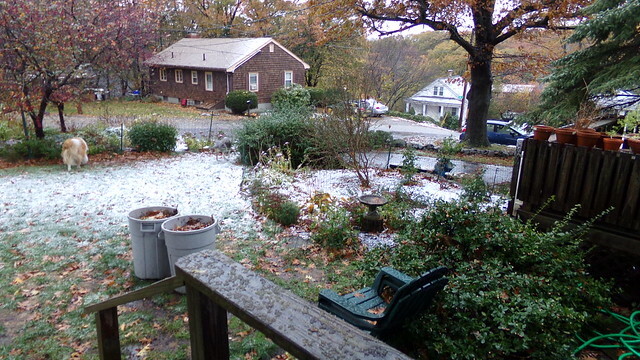 Lots of leaves are falling but there are still lots and lots to come down. 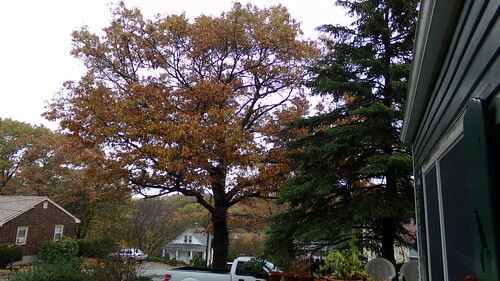 Just look at that oak tree in the neighbor’s yard… lots of raking in Paul’s future! A picture of me (on the right) and a picture BY me (on the left). I can vividly remember having my portrait painted by Mr. Ed Fish in Marblehead back when I was somewhere around 8 or 9… can’t remember the year, but I do remember that dress I wore – it was uncomfortable as all get-out and I hated putting it on and then having to sit there, without moving, in his studio for an hour or two at a time! 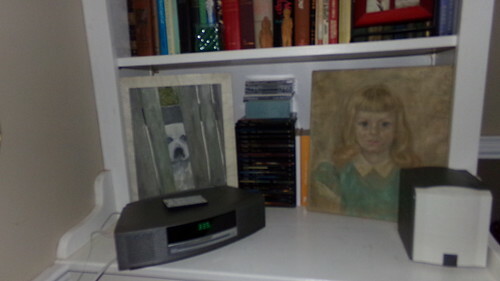 My parents hung that portrait of me on the wall in their front hall, over the radiator, where it sat til the house was sold back in 1986 or 87 (?). I found it recently in my deep dark coat closet and pulled it out. 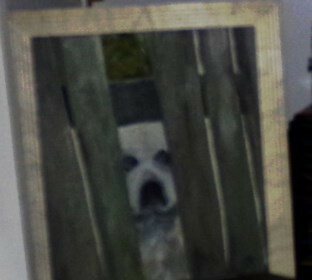 I also found that picture I’d painted of our former great Pyrenees, Esmeralda, done by me from a photo I took of her on our wedding day in 1986. So that’s it from here. Have a good Monday! Sad ending for the man in Salem. Valance! That’s the word. They are really nice. I have never seen the mini-series. I ordered it through Netflix. I also liked the chemistry between Kevin Costner and Mary McDonnell in “Dances with Wolves”, another all time fav of mine. Well, Nora… the fireplace does not work, it’s just for show. There is a chimney but it has a crack in the bricks so we cannot use it. That big birch log Paul got down near the woods after a big storm had blown it over into the street. 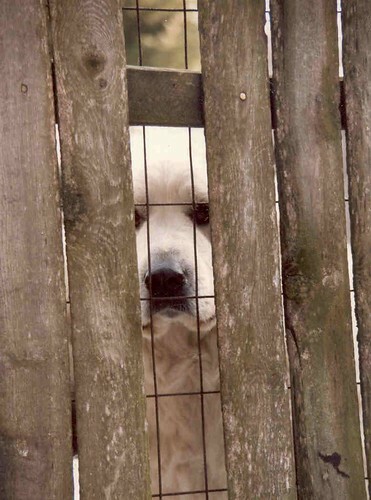 So it just sits there… The dogs like to sniff it. The wood thing over the windows is the curtain rod. We just got a pole at Home Depot and stained it dark brown. I have wooden clip-on curtain hoops that hold the curtains – which, BTW, is a twin sized bedspread cut in half! Oh wait, did you mean the valances over the windows in the living room? I just noticed those! Paul made those, there is one over each of the 4 individual windows in the living room. Dr. Zhivago is also a fave of mine too and I just watched it for the umpteenth time a few weeks ago. There’s almost no better chemistry than that between Julie Christie and Omar Sharif, with the one exception of Jennifer Ehle and Colin Firth in Pride & Prejudice… but that chemistry took the whole series to materialize! Oh, Esmeralda and Nicodemus are truly beautiful! Next painting???? Such a wonderful breed. I like your country setting. That’s a nice size piece of property you have. The dogs are cuddle bugs. That must have been quite a wind storm. The feel good tree is a nice idea. It looks happy. 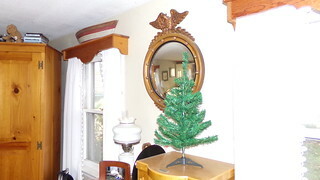 I donated my tree that was about 6′ high but very narrow. I left it up all year and used it for various things. It was like bringing the outside in. I want to replace it now. We’ll need a feel good tree to get through winter. You have good lighting too. Your home is comfy and bright. Love the rocker and the wooden border (name?) over the windows. Have never seen that before. My birds would use that as a perch! My sister had a tree like your neighbor has and her neighbors complained. Does this tree offer you any type of protection or shade? It’s beautiful. I wonder how old it is. The painting of you was worth sitting for and tolerating the dress. It is sweet Bex. The painting of Esmeralda is really good. I like it. It captures her. You’ve obviously got talent. I hope you go back to painting and help inspire me to return. I did enjoy “Local Hero” very much. After I watched “The Notebook” and oddly enough it did nothing for me. I guess things change. But there is nothing for me that compares to “Dr. Zhivago”, my all time favorite. I have watched it many times over the years and it still keeps my attention. Yes, it’s beginning to look a lot like Christmas. Too bad it is only the beginning of November. So far this autumn we’ve been lucky. No severe weather. But I even hate to feel it getting cold. Nice painting. Interesting composition. Yours I mean. I always headed to Bev’s site from your links. I can’t find it now.??? That’s quite a good painting you did of Esmerelda, Bex. You might need to try acrylics sometime and see if the easier set up and clean up helps because you have some talent there. Thanks Maggie. I have just a few paintings. I “took up” oil painting, it lasted for a few weeks, and then I quit. Way too much prep work and then clean-up work. And no good room devoted to it – just the dining room table. I think you need a good craft room to be able to set things out and not have to clean up everything and put it all away after every session. No go here! So painting never stuck with me. 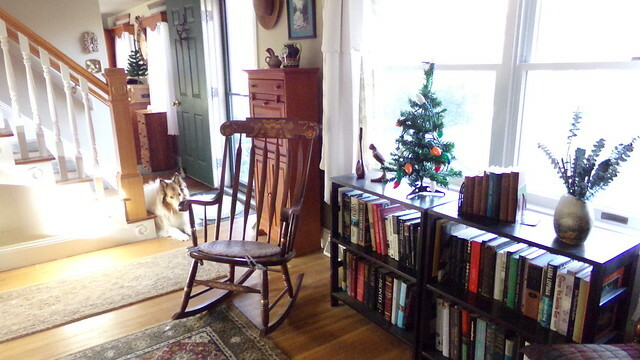 Love to see your reading room again, so cozy! The painting of Esmeralda is beautiful, have you other paintings?